Matthew Arnold, The Poetry. Poetry is a fascinating use of language. With almost a million words at its command it is not surprising that these Isles have produced some of the most beautiful, moving and descriptive verse through the centuries. In this series we look at individual poets who have shaped and influenced their craft and cement their place in our heritage. 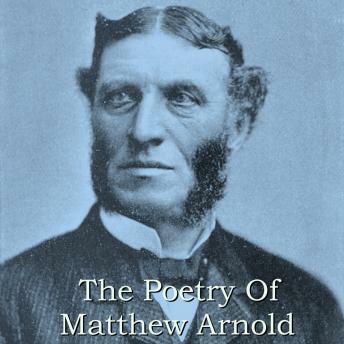 Matthew Arnold is rightly placed amongst the other greats of Victorian Poetry; Browning and Tennyson. The son of the founder of Rugby School he grew up to become a poet via a career as a school inspector. His own words best represent how he came to be so well regarded: "My poems represent, on the whole, the main movement of mind of the last quarter of a century, and thus they will probably have their day as people become conscious to themselves of what that movement of mind is". Many of the poems are also available as an audiobook from our sister company Portable Poetry. Among the readers are Richard Mitchley and Ghizela Rowe. Index Of Poems; The Last Word; The Austerity Of Poetry (A Sonnet); Bacchanalia; Or, The New Age; The Buried Life; A Caution To Poets; Consolation; Continued; Despondency; Calais Sands; Dover Beach; The Sea of Faith; The Divinity (A Sonnet); Early Death And Fame; East London (A Sonnet); Epilogue; Faded Leaves; The Future; Growing Old; Haworth Churchyard; Human Life; Immortality; A Memory Picture; A Modern Sappho; Mortality; A Nameless Epitaph; Religious Isolation; The Youth Of Man; Youth And Calm; West London (A Sonnet); A Wish; A Southern Night; Requiescat; Tristram Ans Iseult.